The Permanent Endowment for Martha’s Vineyard has announced that Johnny Hoy of West Tisbury will receive the 2016 Creative Living Award. As a musician, a mason, and a fisherman, Mr. Hoy has left a deep, diverse impression on Island life. Endowed in 1983 by a gift from the estate of Ruth J. Bogan, the award recognizes Islanders who, through “fine craftsmanship, creativity, and ingenuity,” have enriched the quality of life here. Convinced that “anyone can do anything,” Ms. Bogan was a woman of many skills and unlimited curiosity. With an upbeat, can-do approach to life, Mr. Hoy has become a master of many trades. 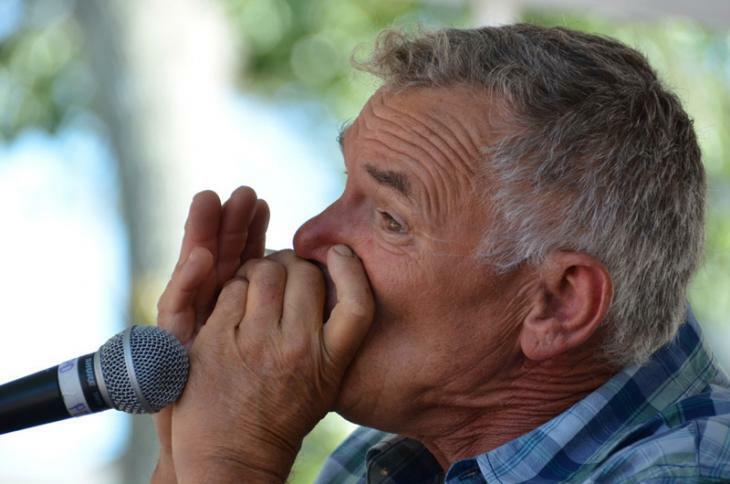 Best known as the front man for Johnny Hoy and the Bluefish, for decades he and the band have entertained Islanders with what he calls bluesy dance music, an infectious sound that gets toes tapping, hips swaying, and cheers up anyone within earshot. A conscientious fisherman who’s as at home on a boat as he is on the bandstand, he provides local fish markets with oysters, bluefish, steamers, codfish, you name it. In West Tisbury he has donated time and energy to rejuvenate herring runs in Mill Brook, the Tiasquam River, and James Pond. And as a mason, he has put his stamp on many foundations and fireplaces around the Island. The Permanent Endowment for Martha’s Vineyard is a community foundation that manages many individual funds, putting charitable contributions to work for Islanders through grants and scholarships. Now in its fourth decade, it continues to build an endowment that will provide resources for the community’s needs in perpetuity. More information is available at endowmv.org. The Creative Living Award will be presented to Mr. Hoy at the Portuguese-American Club on Vineyard Ave. in Oak Bluffs, starting at 5:30 pm, Wednesday, October 26. The winner of a free raffle at the event will be able to choose an Island charity to receive $1,000 from the Endowment.